By Dan Ambrose: 42-year-old Roy Jones Jr. (54-8, 40 KO’s) has lost his last three fights with two of them ending in knockouts. While it may be clear to some that Jones needs to retire from the sport, it ultimately comes down to him whether he feels that its time. Thus far, Jones has been resistant to retiring because of the excitement of competing and obviously the good money that he still gets when he takes on a big name. Jones’ old nemesis, 46-year-old Bernard Hopkins, expressed sadness when talking about Jones’ recent 10th round knockout loss to Denis Lebedev from last weekend. Hopkins says he doesn’t want to see Jones ending his career like this and feels that he can make an impact outside of the ring by not fighting. Hopkins, while older than Jones by four years, is still fighting on a very level and hasn’t been taking the punishment that Jones has been taking in the past seven years. When Jones was in his prime, he was near unbeatable. Indeed, Jones beat Hopkins in his prime and was undefeated for many years. Even last weekend against Lebedev, Jones staggered Lebedev in the 9th round and appeared to have knocked him down at one point. However, Jones looked much slower than he was in the past and the combination of age and all the weight he had put on to make the fight appeared to be too much for him on that night. It was disappointing to see Lebedev knock Jones out cold in the 10th. Jones was badly hurt and laid on the canvas for a long time with both eyes closed. For fans who remembered how great Jones was in his prime, it’s almost inconceivable that it’s come to this. « Is Pacquiao hurting his popularity with all his mismatches? 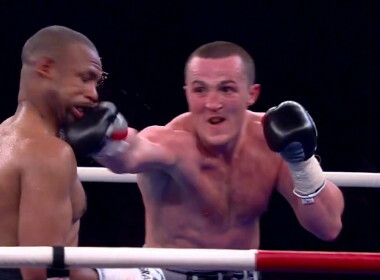 More boxing news on: Jones vs. Lebedev, Jones-Lebedev ,Bernard Hopkins, Roy Jones Jr.